Did you ever wonder what happened to the property and things that were part and parcel of one state when a new state was created out of its territory? So much of the United States was carved out of virgin territory — lands that, for example, the United States bought as part of the Louisiana purchase — that the issue didn’t come up all that often. 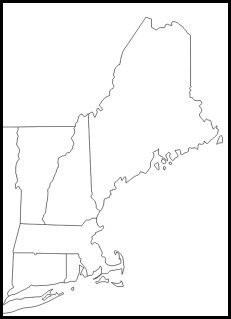 But it surely did come up in 1819-1820 when Maine was becoming a state on its own, after having been part of the Commonwealth of Massachusetts. The Legal Genealogist was poking around in old Maine statutes last night, in anticipation of this weekend’s 2016 Annual Fall Conference of the Maine Genealogical Society in Brewer — sure hope to see everyone there!! And it’s a fascinating peek into the thought processes of people faced with that kind of an issue. An interesting example of a change of jurisdictions was Mobile and Baldwin county in early Alabama. From 1810 to 1820 the county line ran east to west. In 1821 the state legislature rotated the boundary 90 degrees to run north to south. A number of bills had to be passed to clear up the mess the boundary rotation created. These bills named many individuals and at least a few petitions were filed by angry residents. We are currently searching for all of the items in the state archives.